Designed and Made in England by By Hardy Punglia for The Left Bank. 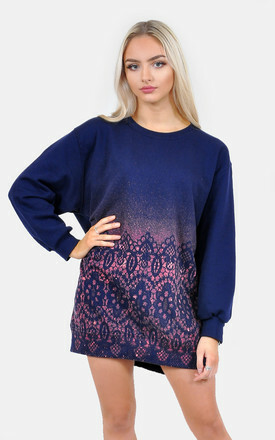 This stunning dark blue(navy) oversized jumper/dress features a lace print on the front (only, plain on the back), in shades of pink/purple. The poly-cotton fabric is fleece-backed to give you that snug feeling making it incredibly soft and cosy, just what you need this winter. The sleeves are full length. The overall fit is oversized and so can be worn as a dress on it's own or teamed with tights/leggings/jeans.